I brought a bottle of Unicum with me on my trip to San Francisco. I knew my mate PW was an inveterate Jägermeister head and figured that I’d educate his palate by treating him to a bottle of Hungary’s finest. Personally, I lost enough of my youth to Jägermeister and have never been a great fan of Unicum, but that didn’t stop me spreading the joy (or is that misery?). He produced the bottle at Jack’s in the Cannery and treated all those present to a shot – a taste test as it were. 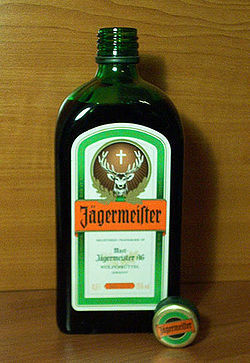 The term Jägermeister was born in Germany in 1934, making its first appearance in the new Reichsjagdgesetz (Imperial Hunting Laws). According to Wikipedia, the term was applied to senior foresters and gamekeepers in the German civil service, while the topmost gamekeeper was Reichsjägermeister Hermann Göring. Thus, when the liquor was introduced in 1935, the name was already familiar to Germans and was occasionally called Göring-Schnapps. YouTube is rife with accounts of the damage this drink can do… despite its composition being mainly herbs, fruit, roots and spices (56 in all, compared to Unicum’s 40) including anise, poppy seeds, saffron, ginger, and ginseng. It sounds almost healthy. I’d heard at one stage that it was banned in 13 US states because of its opiate content… but then maybe I’d had a shot or two and just imagined this. As the brave lined up to sample this exoticism, eager to find something that would outdo the Jäger and enter the folklore of San Fran’s finest imbibers, I sat back and watched. Had I had my camera on me, the pictures of those faces would have spoken a thousand words … and more. Various pronouncements (most of which can’t be repeated lest this blog spontaneously combust) made it quite clear that Jägermeister it wasn’t. Nothing like it at all. Then began the conversation as to which other digestif it compared to. By the time they’d reached a conclusion, the bottle was empty. Enough said. There is, of course, unicum and unicum. I quite like the sort with the red cap, but the black-cap variety (depicted above) is not allowed anywhere up-wind.